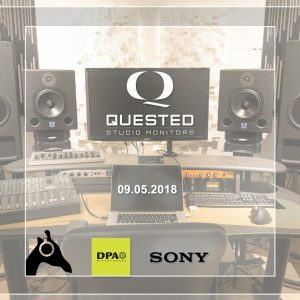 Join us with Quested Monitors, DPA and Sony for a studio mixing and recording open day including exclusive hands-on demonstrations of DPA Microphones and Sony Hi-Res studio mics. This is a great opportunity to improve your studio knowhow and experience. Stuart Down from Quested Monitoring Systems will give valuable insight into the science and art of mixing and the importance studio monitors play in getting a professional, industry-ready product. This includes getting to grips with Roger Quested’s S-Series monitors like the S6R, S7R and S8R as well as the V-Series models – V2108 and V3110. There may also be a sneak peak at something a little smaller and larger coming soon from the manufacturers of these fine listening tools. If you’re anything like us, you’re a bit of a gear junkie. You’ve probably heard ‘of’, though may not have heard all the DPA Microphones studio mics in action. Well you’ll get the chance to see what they have to offer in the way of ultra high-end recording microphones like the d:dicate™ 4006A Omni, 4011A Cardioid and 4015A Wide Cardioid mics. Sony has just announced three brand new Hi-Res studio microphones, which are now available in the UK. The C-100 is a large diaphragm condenser which offers crystal clear response from 20Hz – 50kHz (!). It’s joined in the paddock by two pencil mics with the same frequency ranges: the ECM-100N Omni and ECM-100U Cardioid mics. All three will be on show, come and be one of the first people in the UK to get their hands on these great studio mics.